Here are some common questions we get about Streamcare, and our answers! If you have any other questions, please contact us. Please click on any of the questions below to expand that section. Why did the EMSWCD create StreamCare? Many landowners want to get rid of the weeds along their creek, but do not have the time or ability to tackle the work. Sometimes it can be hard to find experienced crews that will take on an individual landowner’s small project. StreamCare was created to help landowners get rid of the weeds along their creek and replace them with trees. StreamCare allows us to work with multiple landowners along a creek, increasing the efficiency of weed control and planting operations. As the number of projects grows, the benefits to the creek grow. How will StreamCare benefit the creek? StreamCare will protect and improve the water quality in the creek. An increase in shade along the creek will maintain water temperatures that are healthy for salmon and trout. These fish need cold water; warmer water temperatures have a negative impact on their numbers. Research shows that creeks that are surrounded by trees, especially evergreens, have cooler water temperatures thanks to the shade from the trees. The native trees and shrubs also help shade out weeds, prevent erosion, and act as a buffer along the creek. This buffer filters out sediment, chemicals, nutrients, and bacteria. How will participation in StreamCare benefit me? The free weed control and tree planting that will be led by our knowledgeable staff will turn the area along the creek into a beautiful natural area for you to enjoy, without you having to do any of the work! We will also deal with the hassle of applying for and obtaining any necessary permits. More trees also means less erosion and flooding. The native trees and shrubs will attract birds, butterflies, and pollinators. Fewer weeds on your property can increase your property value, and research has shown that buyers will pay more for a property that has a creek. Will enrolling in StreamCare require me to stay out of the area along the creek? When you enroll in StreamCare, you will still have access to the area along the creek, however you agree to use the area in a manner that will not have a negative impact on the project. Livestock have to be kept out of the project area to protect the trees, and financial assistance is available to pay for fencing. Manure cannot be stored in the project area, and you cannot build any structures in this area. You also agree not to alter or remove work completed. Why am I required to sign an agreement? An agreement is needed to ensure that you know exactly what we are committing to do. 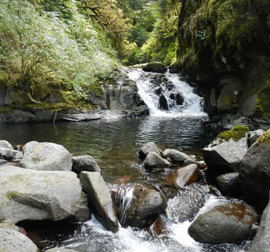 The agreement is designed to protect you as the landowner, as well as protecting the public funding that will pay for the StreamCare projects. What can I expect the StreamCare project area on my property to look like? In the first year, we will begin weed control and the blackberry, ivy, and other weeds will begin to disappear. Any areas that need temporary protection from erosion will be mulched or seeded with native grasses. The native trees will be planted ten feet apart in rows, mulched with burlap, and on most sites will need to be protected from wildlife damage with plastic tree tubes. The tubes will be removed from the site once the trees reach five feet in height. Weeds will be cut back or treated around each tree to maximize survival. On some sites native shrubs will be planted in clusters between the trees. Please see our before and after photos. How will the plants be selected? Soil type, soil moisture, slope, exposure, and elevation of the site will be used to help us determine the best plants for your site. Selection will also be based on availability from local nurseries. Why are only native plants used? Not all plants grow well next to the creek. Our native trees and shrubs thrive under creek-side conditions, and are most likely to establish and grow quickly in these areas. We also know that none of them will become our next invasive weed. How often can I expect EMSWCD staff and crews to be at my site? At first, this will depend on how weedy the site is. In general, crews will be on site two days for weed control, two days for planting, and one day every three months for maintenance. We will always contact you to let you know when we will be on the site. Why not do the work myself? If you choose to do the work yourself, we can offer technical assistance to help you design your project. What if I already have trees around my creek? Existing, non-invasive trees will be left in place. We will assess the site to see if more trees would benefit the creek. The addition of evergreen trees along the creek increases the amount of shade, which not only prevents future weed infestations but also benefits the creek. How can I enroll in StreamCare? Contact us by phone at 503-935-5360 or fill out a site visit request online.